The best way to pack moving boxes is to use medium size boxes. Approximately 70 liters or 24 inches by 20 or 24 inches and 12 to 14 inches high. This way you are less likely to pack too much in the box and then it becomes too heavy. Always put the heavy items on the bottom of the box. A good idea is to put a few books on the bottom of the box and pack lighter items on top. Books way a lot so packing a box full of books puts added strain on your back and the box. You can still label each box from whatever room it came from. I bet you will find a book in every room. After you put the heavy items on the bottom, put lighter objects on top. This way the box is not overloaded and heavy to carry. The center of gravity will be lower in the box and the box will be less likely to tip over during transit. 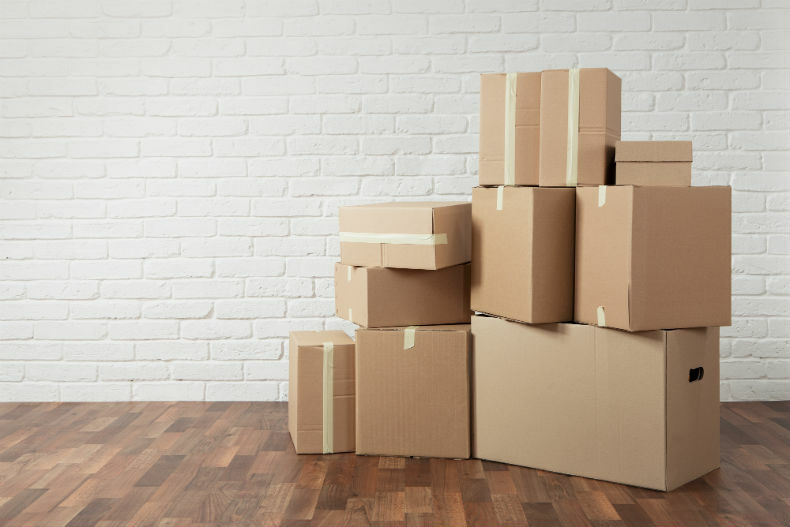 If you do have a lot of books or heavy items to pack, use smaller, stronger boxes. It will make it easier to carry and less risk of the box breaking. It’s tempting to get big boxes to put more stuff into. However unless it’s for pillows or lite clothes, it’s not worth the added hassle of needing two people to carry one box and there is a good chance it will break, which ends up costing you more time. A good rule of thumb is to not pack a box any heavier than 35Lbs (15 KG). Any heavier and you risk injury and you get fatigued faster, making the move that much more unenjoyable. Layer items in the moving box. Heavy items on bottom then use some padding between the next layers of stuff. Use newspaper or even hand towels and linens work well to add padding and protection. If there is still some space on top, use this for those little nick knacks lying around the house. A great tip for packing dishes in moving boxes is to pack them on their side. They are much stronger on their sides then stacked on top of each other. Make sure you have plenty padding on the bottom of the box and place layers of packing paper or newsprint between each plate. Finally make sure the packing around the plates makes for a snug fit in the box so there is very little movement. Make a Priority Box. Nobody wants to be hunting around for the toothbrushes on the first night of the move so make up a couple boxes that have everything you will need on the first night and also for the next morning. Bets suggestions are toiletries, baby food and bottles, coffee mugs. Pack a few plastic glasses and plates. Medications and other health items need to go in this box. Pack some snacks. Don’t forget the babies “blanky” (or yours…we won’t tell).